Democracy is the worst form of government except for all those other forms which from time to time we have tried. Granting this, we might be inclined to wonder what sorts of democratic decision-making procedures are possible? This is a question that Christian List sets out to answer in his paper “The Logical Space of Democracy”. In this post, I want to share the logical space alluded to in his title. 1. Robustness to Pluralism: The procedure should be able to accept any possible combination of individual attitudes about propositions which are on the “agenda” for any given decision problem. 2. Basic Majoritarianism: A necessary condition for the collective acceptance of any proposition should be its majority acceptance. The conclusion of the trilemma is that it is impossible to satisfy all three of these requirements at the same time (at least when dealing with reasonably complicated decision problems). At best, it is possible to satisfy two at the same time. I tried to explain why this conclusion was true in the previous post. The important thing for now is that this conclusion provides us with a framework for thinking about the logical space of possible democratic decision procedures. If we know that it is impossible to satisfy all three requirements at any one time, the question is: which two requirements will we prioritise? This implies that there are three major “territories” within the logical space of democracy, each occupied by a number of different sub-types of decision procedure. Let’s explore these three major territories now. The first major territory is marked by its willingness to give up the need for robustness to pluralism. As mentioned previously, robustness to pluralism is the notion that a decision-making procedure should be able to accommodate any combination of attitudes towards any of the propositions on a particular decision-making agenda. Procedures that drop this requirement place constraints on the permissible combinations of attitudes. Doing so then eliminates possible inconsistencies at the group level. As we saw, problems arise if the collective decision results from the complete, consistent and majoritarian aggregation of all possible individual attitudes toward each of these propositions. Specifically, allowing any combination of attitudes to be fed into the decision-making procedure could have resulted in a situation in which the collective rejected proposition A, but accepted propositions B and C. This would result in collective inconsistency. You could avoid this inconsistency by placing limitations on the combinations of attitudes that are allowed to filter up to the group level. The simplest way of doing this would be to require unanimous opinions on each of the propositions. In other words, everyone has to accept proposition A in order for it to be accepted by the group, and so on. This would ensure consistency at the group level. Another, more laboured but perhaps more realistic, way of doing it would be to allow for some meta-consensus between different collections of attitudes. In other words, to allow for some cohesiveness between the different attitudes adopted by the individuals within the group. This is something you will be familiar with from real-world politics. It has often been noted that those on the left and those on the right have opposing views on whole sets of propositions. Thus, for example, those on the (American) right are likely to be more hawkish, in favour of gun rights, against church-state separation, in favour of free markets, against universal healthcare and so on. Those on the left are likely to take the opposing view on each of those issues. This correlation (meta-consensus) of opinions may help to avoid possible inconsistencies at the group level. To return to the example above, it may be that people who reject proposition A, are also more likely to accept B and reject C; whereas those who reject B, will be more likely to accept C and A (or some such). These correlations in attitudes will then filter up to the group level, preventing a scenario in which the collective accepts the inconsistent set of propositions. To be more precise, and as List notes, if we assume that attitudes toward relevant propositions are aligned along a unidimensional axis (like the left-right axis) then the majority attitudes will tend to coincide with the individual attitudes of whoever occupies the median position on the relevant axis. There are several dubious assumptions underlying this analysis. The obvious one being that attitudes toward whole sets of relevant propositions may not align along single dimensions. But there is, nevertheless, something close to the real-world about this analysis. 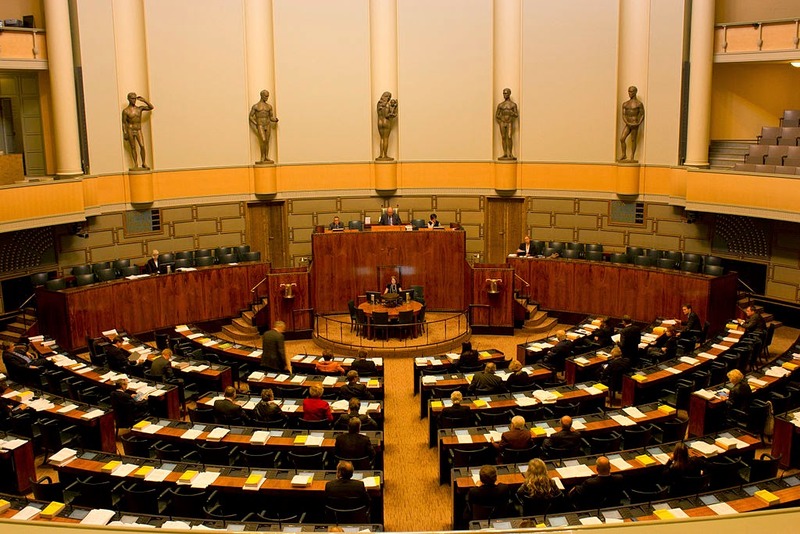 It is often noted, at least in countries like the U.S. with a two-party system, that collective decision-making tends to align with a “centrist” viewpoint. Anyway, this is all by the by, the important point is that within this territory of possible democratic decision-making procedures, the focus is on limiting possible combinations of attitudes. List suggests that there are two ways in which this can happen in the real world. First, there may be exogenous pressures that limit the possible attitudes possessed by those who participate in the decision-making procedure. This would be consistent with the views of certain communitarians or nationalists who think that there should be some level of group harmony prior to democratic governance. Second, there may be endogenous pressures that limit the possible attitudes. That is to say, democratic decision-making procedures may themselves force people to limit the possible combinations of attitudes they have toward different propositions. This would be consistent with the views of deliberative democrats, who believe that the open discussion about the propositions on a given agenda (prior to any attempted aggregation) is likely to make for more consistent group decision-making. The next major territory within the logical space of democracy is the one that casts off the need for majoritarianism. At first glance, this seems to be anathema to the very concept of democratic decision-making, but it’s possible to imagine systems which reject the need for majoritarianism and yet still retain a flavour of democracy. To see this, it is once again worth dividing the methods for doing so into exogenous and endogenous types. Within the exogenous class we get decision-making methods that rely upon external factors to limit the need for strict majoritarianism. By strict majoritarianism I mean any method that requires that the collective decision reflect the majority opinion on each and every proposition on a given agenda. List mentions two exogenous methods for avoiding the need for strict majoritarianism. The first method involves the prioritisation of certain majority attitudes over others. For example, in the decision problem given above, we might argue that the majority view about proposition C take priority over the majority view on proposition B. In other words, we might decide that although all the propositions have some relevance to the collective, what is most important is the attitude towards the invasion of country X, and not the commitment to the principle for legitimate invasion stated in proposition B. Thus, if there is an inconsistency in the collective attitude, we should go with the collective attitude toward C and not towards B. List suggests that constitutional democracies, with their penchant for protecting certain fundamental rights and freedoms, could be viewed as providing democratic decision-making frameworks that lie within this region of the logical space of democracy. A second exogenous method for avoiding strict majoritarianism would be to adopt a system of sequential priority procedures. These are decision-making procedures in which the collective attitude toward one proposition must be determined before proceeding to the next. The procedure would then be structured in a way that avoids the possibility of inconsistent collective attitudes. To return to the decision problem given above, a sequential priority procedure might require first ascertaining the majority view on proposition A, and then on proposition B. If the majority accepts both propositions, then the collective attitude towards C is determined. Likewise, if the majority accepts A but rejects B, then C should not be considered. In this manner, inconsistent collective judgments can be avoided. Turning then to endogenous methods for avoiding strict majoritarianism, List notes how certain legislative procedures may allow for groups to achieve some sort of “reflective equilibrium” between their attitudes towards certain propositions. So, in the case of the decision to invade country X, a parliament that decided that they rejected proposition A, but accepted propositions B and C, could enter into a period of further reflection on the inconsistency between their attitudes. This would force some revision in the collective attitudes towards the individual decisions. Borda’s counting method of preference aggregation is also an example of an endogenous method for ensuring pluralistic and rational collective decisions that nevertheless reverses some majority preferences. The final territory within the logical space of democracy is the one that rejects the need for collective rationality. As we saw the last day, collective rationality is the notion that collective decisions should be complete and consistent. That is to say: they should cover every proposition on a given agenda, and they should ensure that the collective attitudes towards those propositions does not entail some inconsistency. The working example in which the cabinet rejects proposition A, but accepts proposition B and C is a classic illustration of a complete yet inconsistent decision. When it comes to loosening one of those requirements, List argues that completeness is the only one that can go. The reason for this is that if you loosen the need for consistency, it creates problems for the action-guiding-ness of collective decision-making. That said, he recognises the loosening of consistency as a logical possibility, just not one he cares to consider in any depth. With that in mind, there are, once again, exogenous and endogenous methods for avoiding completeness. The exogenous methods would involve partitioning the agenda in advance so that the collective attitude only needs to be provided for certain propositions (not all). Thus, when deciding about invading country X, the cabinet could determine that proposition C is the only one that needs a collective decision. List refers to this as a “conclusion-based procedure” as it involves ignoring the empirical and normative grounding for a particular decision. Endogenous methods might also achieve the same thing. These would not entail any advance partitioning of an agenda but, rather, an effective partitioning through the use of some decision-making rule. For instance, supermajoritarian or consensus-based decision-making might work by preventing the collective from coming to a particular view on a particular proposition without crossing some threshold of acceptance (e.g. 75% or 100%). A complete map of the logical space is provided in the diagram below. To briefly recap, despite its popularity, true democracy is difficult to achieve in practice. This is because there are a number of things we would like to get out of a democratic decision-making procedure, that we simply cannot get. This is demonstrated by famous voting paradoxes and, more generally, by List’s democratic trilemma. Because of these impossibilities, the space of possible democratic-like decision-making procedures is more limited than we might first realise. 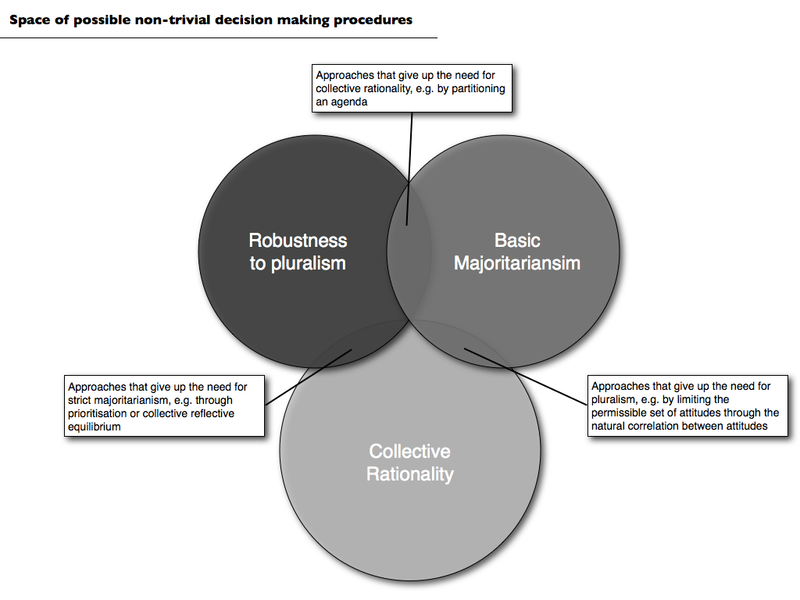 We really only have three options: (i) procedures that reject our commitment to pluralism; (ii) procedures that reject our commitment to majoritarianism or (iii) procedures that reject our commitment to collective rationality. We can see examples in the real world of decision-making procedures that fall into each of these three categories.